You can try to use a very simple analogic model to understand. Let’s take few ice cubes (they are your iceberg!) and put them in a glass (your southern ocean) and ……………wait and see! This is so disappointing! And a little surprising for anyone who is not a physicist. So I asked a physicist for some help. It took him a least 5 min to understand what I did not understand. Then he told me (with a little contempt…. ): “but my dear, this is basic physics!”. So let’s go for a short basic physics lesson! The level of the ice will not change because the volume of the ice and the volume of the water that it will forms are quite the same. I don’t know about you, but I need numbers to understand (simple numbers!). Let’s imagine that the ice in the glass is a big cube of 8 cm3 (2cm x 2cm x 2cm). The density of the ice is 0,92 g/cm3 so the weight of the ice will be 8 x 0,92 = 7,36 g.
The density of the water is 1g/cm3 so when your ice cubes melt, they will produce 7,36g of water. It’s a simple question of density. 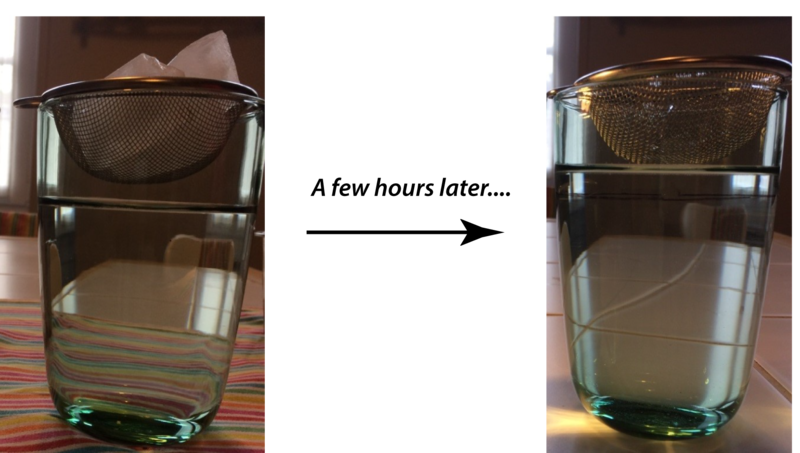 For the same weight, the ice takes more volume than the water. You can also try to put a full bottle of water in the freezer and wait for a few hours. Then, you will see that the ice takes more space than water for the same weight (ok, don’t try this, I don’t want any trouble with your mum…). So? Ice melting has no influence on the sea level? 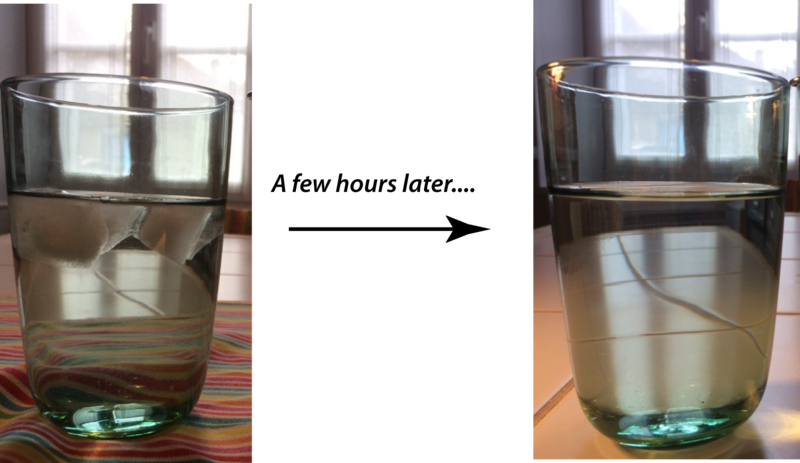 Wait a few hour hours and you will see that the level of the water in your glass has increased. So, the melt of the ice which is already in water will not change the sea level (melting of the sea ice for example) but the sea level will rise if the ice was not initially in the sea. This is the case for melting of the ice sheet. It’s a little more complicated for ice shelves because they are the floating part of an ice sheet. Melting ice shelves will not raise sea level by themselves, but ice shelves are important indirectly to sea level, as they slow down glaciers that drain the ice sheets that are on land and above sea level. If an ice shelf melts, the glaciers they were holding back slide into the ocean more quickly. And this is what raises sea levels.